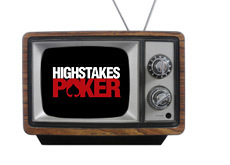 Day 2 of taping for the sixth season of "High Stakes Poker" is currently under way at the Golden Nugget in Las Vegas. There are three full days of taping scheduled (Wednesday-Friday), with the first new episodes of season 6 hitting the airwaves in February. Yesterday we told you that names such as Phil Ivey, Tom Dwan and Daniel Negreanu were participating in the first day of filming. Here is the line-up for the second day of filming, which just got under way..
That has to be one of the most stacked tables in the history of "High Stakes Poker". This should be a great season, as Tom Dwan, Daniel Negreanu and Phil Ivey look to be participating in a good portion of the sessions. On Friday, names such as David Benyamine, Sammy George and Eli Elezra should be inserted into the line-up. I imagine that there might be some bumps though if the bigger names decide that they want to keep playing..
Can't wait for these episodes to start airing on February 14th..